CAA has been awarded a $15,000 grant from the National Endowment for the Arts (NEA) to support the next installment of ARTspace, taking place during the 2016 Annual Conference in Washington, DC. Spearheaded by CAA’s Services to Artists Committee, ARTspace is a forum for programming designed by artists for artists that is among the most vital and exciting aspects of the conference. Held at each Annual Conference since 2001, ARTspace is intended to reflect the current state of the visual arts and arts education. ARTspace offers free program sessions and includes diverse activities such as the Annual Distinguished Artists’ Interviews (most recently with William Pope.L and Ursula von Rydingsvard in New York in February 2015); screenings of film, video, and multimedia works; live performances; and papers and presentations that facilitate a conversational yet professional exchange of ideas and practices designed to engage CAA’s artist members as well as the general public. The grant, which is the NEA’s seventh consecutive award to CAA for ARTspace, will help fund programs such as ARTexchange, the popular open-portfolio exhibition for artists; the Distinguished Artists’ Interviews; and the Media Lounge, a space dedicated to curated programs of film, video, and multimedia work. 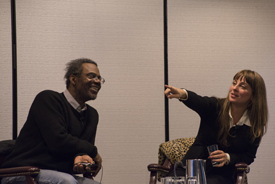 ARTspace programming at the 2015 conference in New York included panels that explored the shifting landscape of the field, from “Surveillance as Art Practice” and “Art Collectives and the Contemporary World” to “Balancing Act: Art, Family, and Other Distractions” and “Imagining an Alternative School of Art.” You can explore all of the 2015 ARTspace programming on the conference website. CAA’s 104th Annual Conference will take place February 3–6, 2016, in Washington, DC. Through grants to thousands of nonprofits each year, the NEA promotes opportunities for people in communities across America to experience the arts and exercise their creativity.